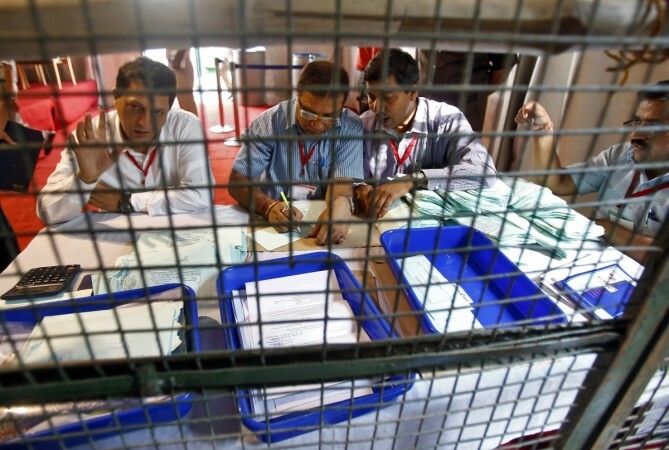 The election for 140 assembly seats in Kerala was held on May 16. Anik Akkara won the Wadakkanchery seat by 43 votes. 7:30 p.m IST. : After clearing the technical glitch with the voting machine, the counting in Wadakkanchery began at 7:30 p.m.
4: 30 p.m. IST: Although UDF's Anil Akkara is leading in Wadakkanchery by merely 3 votes, the election commision is yet to declare the result as there is tachnical glitch with the voting machine. 8:00 a.m.: Vote counting begins in Kerala. The results of postal votes will be out within 10 minutes. The counting of the votes for the Kerala Assembly elections will begin around 8 a.m. and could be over by 3 p.m. on Thursday, May 19. Assembly elections were also held in West Bengal, Assam, Tamil Nadu and Puducherry over the past two months. According to the Press Trust of India, the trends of the results would start to show by noon on Thursday. The counting of votes from Electronic Voting Machines (EVMs) would begin half an hour after the postal ballots counting is over, the Election Commission has said. Although the result would finally be out by Thursday evening, the exit polls have predicted a victory for the Left Democratic Front (LDF) in Kerala. The election in the state for 140 assembly seats was held on May 16 and recorded 77.35 percent voter turnout, the New Indian Express reported. According to the exit polls, the Congress-led UDF coalition has been projected to get 43-70 seats, while the LDF is seen winning 69-94 seats. The average of the polls shows 79 seats for LDF and 57 for UDF, while the BJP gets only three seats. Key players in the Kerala Assembly elections are the Congress' Oommen Chandy (Puthupally), the CPI(M)'s VS Achuthanandan (Malampuzha), KM Mani (Palai) and PK Kunhalikutty (Vengara), the BJP's O Rajagopal (Nemom), cricketer Sreesanth (Thiruvananthapuram), PC George (Poonjar), Pinarayi Vijayan (Dharmadom), actors KB Ganesh Kumar, Jagadeesh, Bheeman Raghu (Pathanapuram), journalists MV Nikesh Kumar (Azhikode), Veena George (Aranmula), actor Mukesh (Kollam) and CK Janu (Sulthan Bethery).